Kenya's David Rudisha is one of the most exciting 800m runners to emerge in recent times and could go on to be one of the all-time greats after breaking the world record in 2010 and winning the world title one year later in Daegu. The streamlined Rudisha at 1.90m, now targets the holy grail of Olympic gold in London where he might just go on to break the mythical barrier of 1min 40secs over two laps of the track for a feat never seen before. 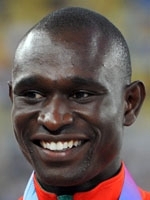 His time of 1.41.01 in Rieti, Italy on August 29, 2010, just one week after shaving .02secs of the long-standing record of Kenyan born Danish icon Wilson Kipketer set back in 1997 is the current world record but he also holds four of the ten fastest times in history. One year later at the world championships, Rudisha confirmed his outright status as the world's best when he stormed to gold by leading from start to finish and defeating his chief rival Abubaker Kaki of Sudan with a devastating kick to the finish. That triumph which came two years after his semi-final elimination at the 2009 world championships in Berlin was sweet reward for his rising talent and hard work. "I controlled the race from the start because this time I didn't want to make any mistakes," he stated after getting boxed in when the race was on the line in Berlin. An ankle injury cruelly deprived him of a crack at Olympic glory in 2008 at Beijing, but he now goes to the London Games as overwhelming favourite despite the threat of Kaki. "Tall, slender and limber, Rudisha is magnificent to watch run," praised the legendary Sebastian Coe while Kipketer himself added: "David will be the first to go under 1min 40sec and he is someone who thinks and listens carefully. Whoever breaks his record has not even been born yet". Swift over 400m with a personal best of 45.50sec, he has followed and gone past the footsteps of his father Daniel who won Olympic silver in 1968 as part of the Kenyan 4x400m team in Mexico where the USA took gold. "When he showed me his medal, I picked up the dream early in life to follow his steps," he said proudly. Like many up and coming champions from the region of Eldoret, he was guided by the Irish priest Colm O'Connell who has groomed some 25 Olympic and world champions over 40 years, including a certain Wilson Kipketer. After initial attempts in 2004 at the 200m, 400m and the decathlon, Rudisha ran his first 800m race in an impressive 1min 49secs at just 16 as he looked to gain inspiration from his idol and double 800m world champion (1987, 1991) Billy Konchellah. The indications were clear when he became world junior champion in 2006 and African champion in 2008 that his career was not going to stop improving with time. Then came the stunning world record in Rieti with that run of 1min 41.01secs and he was then named the youngest ever winner of the IAAF world athlete of the year in 2010. Olympic champion in waiting? London awaits!